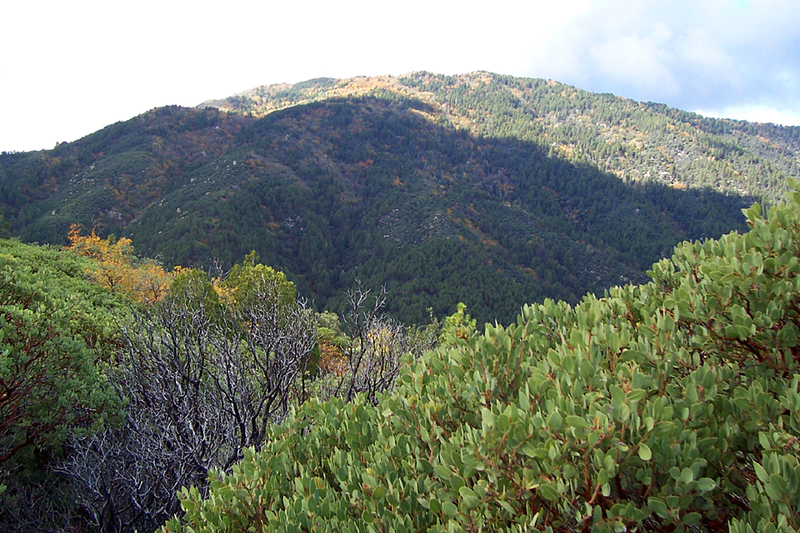 The East Mountain Trail follows the ridge line of East Mountain, on the eastern side of the Pinal Mountains, near Globe. Beginning at Pioneer Pass Trailhead below Pinal Peak, begin following an old jeep road uphill to the east. A splintered wooden trail sign soon lets you know that you are on the East Mountain Trail #214. After a short time, the road becomes a trail, and enters the pine forest of upper Pinal Creek canyon. The trail proceeds to climb higher on the north slope of the ridge through ponderosa pines and plentiful gambel oaks. There are some good views of Pinal Peak to the west in this area. After passing through a brushy saddle, the trail climbs gently as it rounds the eastern side of the 6760' hill. 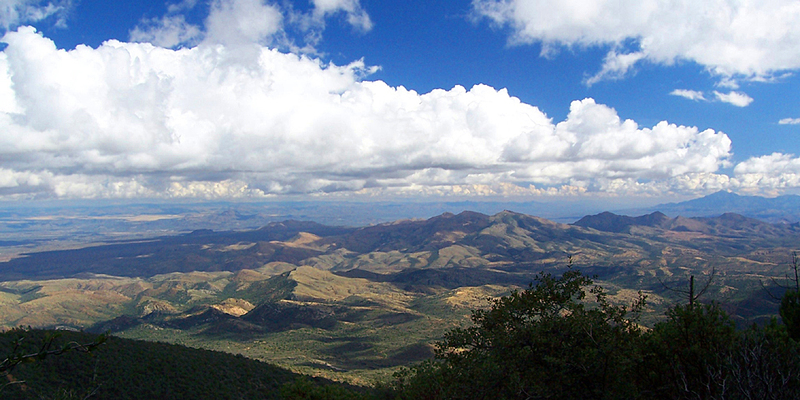 This stretch provides wonderful views of the Pinal Pass area, and the vast expanse of the San Carlos Apache Reservation. At the next saddle, known as "Dead Tree Saddle", the East Mountain Trail crosses over to the west side of the ridge, and contours along the forested slopes of 6892 foot East Mountain. The trail rejoins the ridge line just north of East Mountain, then begins a long and gradual descent along the spine of the ridge. North of East Mountain the trail begins to fade, but well placed cairns keep one on track. 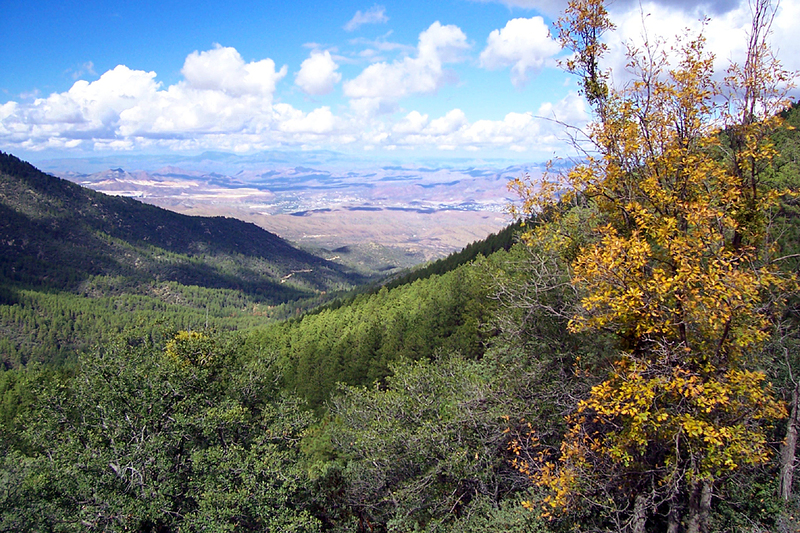 The vegetation changes back and forth from pine forest to brush, all the while offering nice views of the Pinal Mountains, the Globe area, and the Apache Reservation. About a mile past East Mountain, the trail drops off the west side of the ridge, and begins switchbacking down to the floor of Pinal Creek. At the bottom of the switchbacks, the trail encounters a large sycamore tree, at the base of which is Bear Paw Spring. The cement trough was full of water when I hiked this trail. The East Mountain Trail soon comes to an end where it meets the Toll Road Trail #200, at the bottom of the canyon. It is only a 0.25 mile hike to the south on the Toll Road Trail to where it meets up with forest road 112, at the unsigned Lower East Mountain Trailhead. Return the way you came, or hike 1.55 miles up forest road 112, back to the Pioneer Pass Trailhead.